today, eyebrow transplantation is popular among people, because they are looking for ways to fix or repair their eyebrows permanently. Royan Moo Salamat aim to provide the highest quality services and by providing the Installment payment guarantees your eyebrow transplantation. The first introduced eyebrow transplantation method was the FUT method. 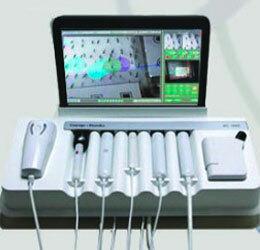 This method of implantation was obsolete in a short time due to many complications such as surgery, pain, bleeding, stitching, multiple sessions, etc. And gradually this method was not used in different countries. The most recent and most comprehensive method which is used in the world is eyebrow transplantation by Super FUE. 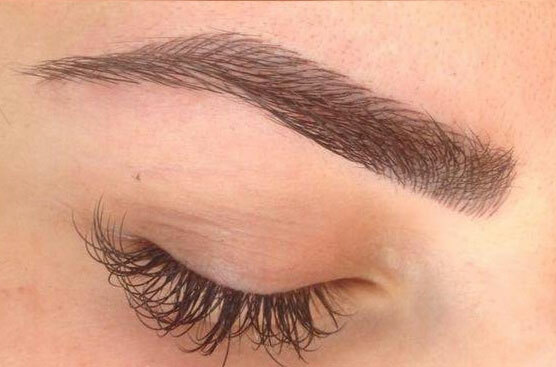 In this method, there is no need for many sessions, stitches and terrible cutting, and the eyebrow growth line and the its shape are designed and executed according to the wishes of the person. The advantages of eyebrow transplantation by SUPER FUE method are no recovery is needed and no swelling in the face and eyes. It is worth noting that if you already tattoo and shaved your eyebrows, one other benefit of using the SUPER FUE eyebrow transplantation is its ability to perform on tattooed eyebrows. In FUT method a flap strip is harvested from behind of patient’s ear. The reason for this is that the hair on the back of the ear is like eyebrows. Then it will transplant in the desired part. After 7 to 10 days, stitches are drawn. 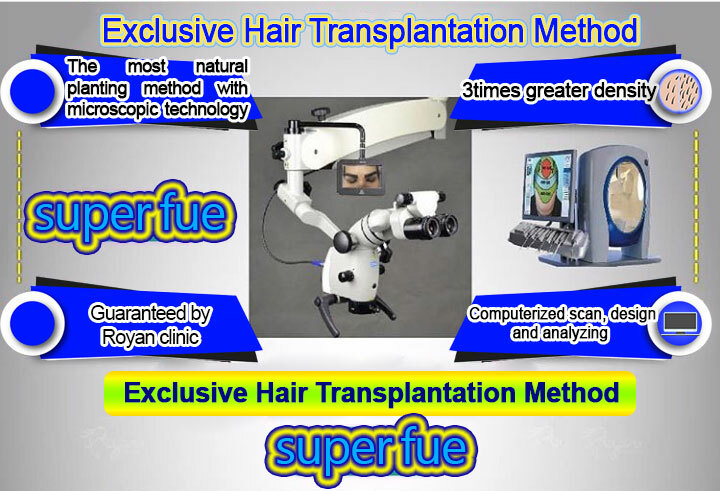 The Super FUE method is the most advanced global method, this method is first offered in the Middle East exclusively to the Royan Moo Salamat Clinic. 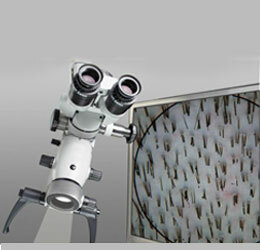 In this method, an advanced hair scanner is used to examine and multi-root thick hairs are detected and harvested by the machine. 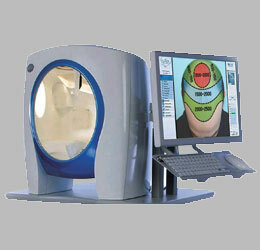 Digital scanning and analyzing and design for diagnosis of hair follicles harvested and selecting the best follicles for planting. Eyebrow planting is done Royan specialized clinic of skin and hair with a specialized team using updated world's science on an outpatient basis with local and painless anesthesia in a single session of about an hour, this means that, a number of hair that is removed from the back of your head is planted on your eyebrows area. Important Note: The amount of hair removed from the head is limited to a certain number of hairs which have an appropriate thickness for your eyebrow (not all hair of any thickness). In short, you should choose thin hair with same diameter as your eyebrows. Because if the hair is thick, the eyebrows will be rough and ugly. Choosing this hair diameter requires the expertise of the professionals. For more information and free advice about services, fees, and etc. please call 22885890-021, 41936-021. The most important thing in eyebrow transplantation is to maintain the natural growth direction of eyebrow hairs. 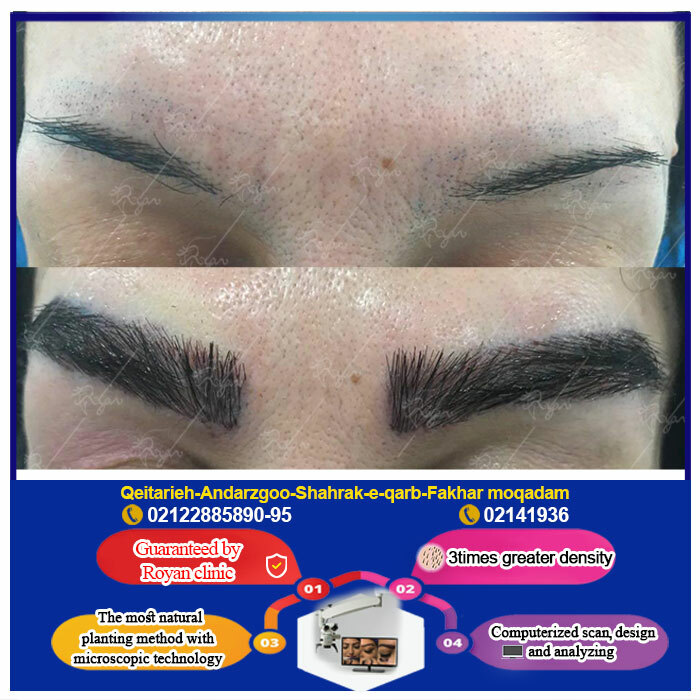 This requires the surgeon to skillfully determine the angle of implantation of each hair, which in the end, the arcuate shape of eyebrow and convergence of the upper and lower eyebrows and then upward placement of eyebrow head's hairs, is naturally restored. The second most important point is that when creating holes in the skin for hair transplantation, very delicate needles should be used, which will prepare implantation area with a very small angle on the skin surface. thus, planted hairs will grow on the skin surface like eyebrow hairs. 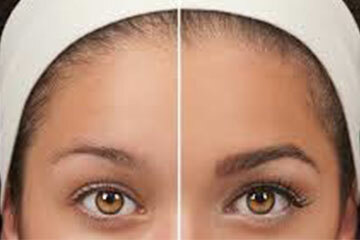 Eyebrow planting is an operation in which hair grafts are harvested from head and planted in the eyebrows. eyebrow plantation manner includes density and its angle to skin which is carefully designed by a surgeon and beauty specialist. So the eyebrows will plant exactly according to your desire and natural form. If FUT method is used to harvest graft from head, cutting area should be stitched, after 7 to 10 days stitches will remove, and if the FIT method is used, there will be no stitching. Who can do eyebrow transplantation? Those who do not have proper eyebrow shape (they constantly required to correct their eyebrows shape with an eyebrow pencil). They can plant eyebrows to change their eyebrow shape. For those who have burns or stitches (scars) in their eyebrows, eyebrow transplantation is the best options to repair them. Those who already have eyebrow tattoos, but are tired of their form, can also transplant eyebrows on their tattoos using special techniques. Those who have lost part of their eyebrows due to certain diseases or other things can use eyebrow transplantation to fill in that area. Eyebrow transplants are becoming a popular option for women and men alike, and can meet the needs of people experiencing eyebrow hair loss. Eyebrow restoration can also enhance eyebrows that do not have enough density, thickness and definition to achieve desired aesthetic results. The reasons people undergo eyebrow restoration can be as varied as the individuals that opt for the procedure, and can be sought due to illness, surgery, trauma, skin conditions, overzealous eyebrow plucking or naturally thin eyebrows. Royan moo has performed eyebrow hair transplants for all of the above reasons, and the results can be seen in before-and-after eyebrow restoration photos on this site. Although some people debate whether they should consider an eyebrow hair transplant or should instead tattoo the eyebrow, many people find that eyebrow tattooing provides inadequately natural results that appear painted on, despite the most artistic attempts at fashioning an eyebrow. When it comes to techniques used during an eyebrow hair transplant, it is imperative that an eyebrow transplant surgeon pay meticulous attention to technical detail, while drawing upon exceptional artistry. The unique flat hair angle, natural curl, and proper design pattern of the eye brow are all integral to the creation of an attractive and full eyebrow contour that is the ultimate goal of an eyebrow hair transplant. During eyebrow transplant surgery, a patient’s finest hairs are individually extracted from the back of the head. Grafts typically include only single hairs, although for individuals with truly fine hair, two-hair grafts are occasionally used for transplantation at the inner club portion of the eyebrow. Each hair graft is carefully prepared and is then placed with precision in the areas of hair loss in the eyebrow region. It is extremely important that the angles of each eyebrow hair be placed correctly in order to ensure a natural result. 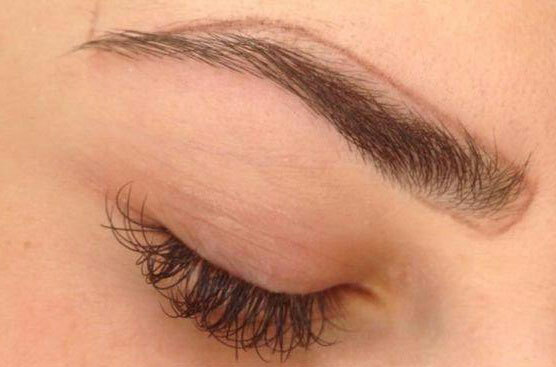 Eyebrow hair angles must be very flat along the skin, have a proper shape toward the nose, and a “fish-tail” appearance . The cost of eyebrow transplant surgery will differ based on a number of factors that are unique to the needs of each patient, including the eyebrow replacement coverage area, the thickness and density of the eyebrows, and the number of hair grafts required to create the most natural and visually appealing eyebrows. The cost of eyebrow transplant surgery will be discussed with you during an initial consultation. Eyebrow hair loss can occur due to a variety of reasons. Certain diseases like low thyroid condition can pre-dispose individuals to eyebrow hair loss. 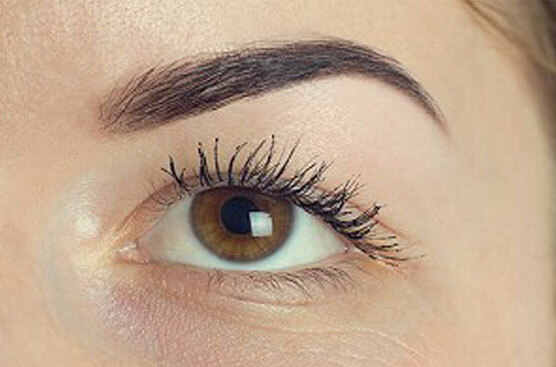 Another situation that may benefit from eyebrow transplantation is over-plucking or over-tweezing of the eyebrow area, which can result in a partial or total absence of eyebrow hair. Additionally, trauma or accidents can cause eyebrow hair loss, and surgically -related eyebrow hair loss can result from skin cancer operations or other surgery in this area. Some individuals are simply born with thin eyebrows and are interested in undergoing an eyebrow hair transplant because they desire thicker eyebrows to more dramatically frame their eyes and to make their face and eyes appear more attractive. No matter what the cause of eyebrow hair loss may be, the most effective solution to restore eyebrows to a desired state is surgical hair transplantation. 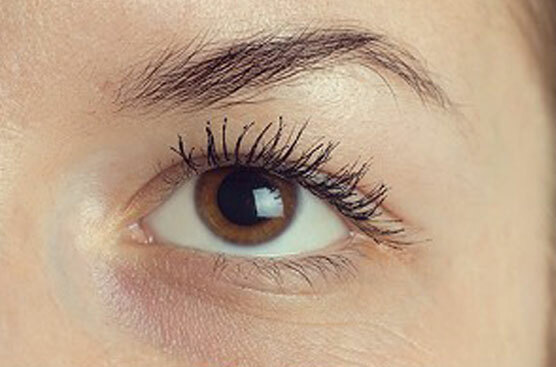 Transplanted eyebrow hairs initially grow at the rate of the donor scalp hair, but over time (especially after the first year or two) growth can begin to slow down to a more natural rate of eyebrow hair growth. This change in hair growth is due to the influence of the skin in the eyebrow region and the impact it has on the growth of the transplanted hairs, a condition known as recipient dominance.